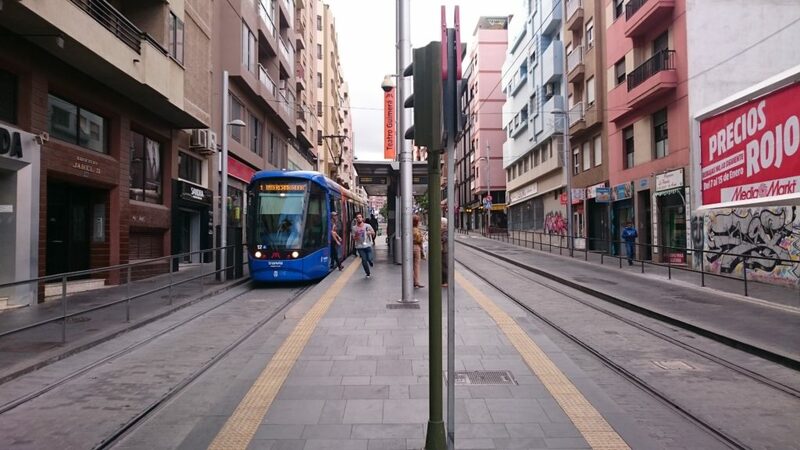 This is our extensive review of the only tram system on the Canary Islands.’Tranvía de Tenerife‘ tramway which operates in Santa Cruz and La Laguna on the Tenerife island, is the only one one in the area. The island had a tram system before, but it was closed in 1952 due to technical failures and because of the busses that became quite popular as people thought that was the future back in the days. Santa Cruz got around 360 000 inh. 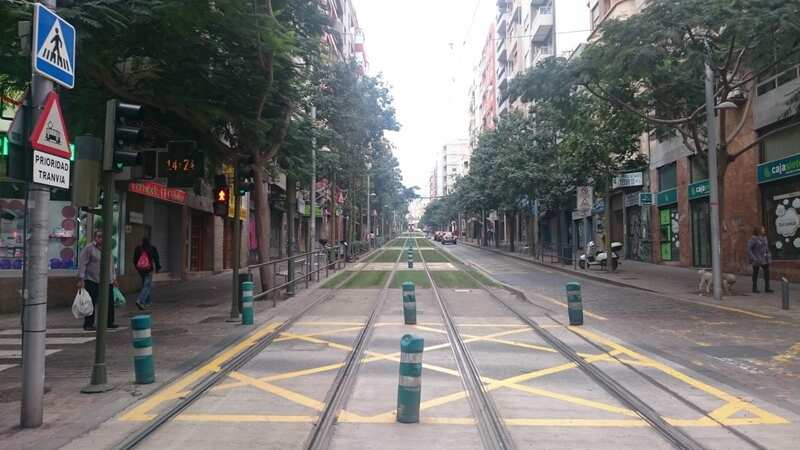 so it was a really good idea to add a tram to the city for sure. The system consists of two lines and was opened in 2007. First one connects La Laguna at La Trinidad station and Santa Cruz cities together, is called T1. It is the longest of the two lines and is also the most interesting one. The other line called T2, which will be extended in both directions, is currently a very small line. It runs between Tincer and La Cuesta, with only 6 stations. The line crosses line one at Hospital Universitario and at El Cardonal, and runs on its own path as T1 one does all the way. All of the tram trains are delivered by Alstom and they are all low floor trams that can run upto 70km/h. The stations are also all perfect made for strollers and people using wheelchair. All of the seats are also comfortable and all of the informations about next stop inside the trams or the information leds at the stations are well made and informative. One funny note though, is that if you do have a monthly card, you can register yourself by tapping your cellphone to QR-code etc. It is a nice touch, but the need to activate the ticket each time you enter a tram train, is a bit hassle we think. One activation should be enough etc. after you buy the ticket. The information about the routes that you find inside of the trams, are also well made. You don’t need to understand Spanish to understand it etc. This I liked a lot and is great thing to do. One other great feature of this tram system, is the comfort of using the ticket machines. They are in many languages and they are quite easy to understand. Remember also that most of the tickets includes bus routes on the island. 24 hour Round-Trip ticket: 10% off single ticket price! The prices are nice, but a 7 day card is missing. Its not a big deal, but if you want to go around the island a lot for a week, it would be a nice thing. If you take the tram as part of your holiday, then you will be stunned about the view that the tram line called T1 gives you. If you start from Padre Anchieta station, where bus number 102 stops from Puerto de la cruz stops. 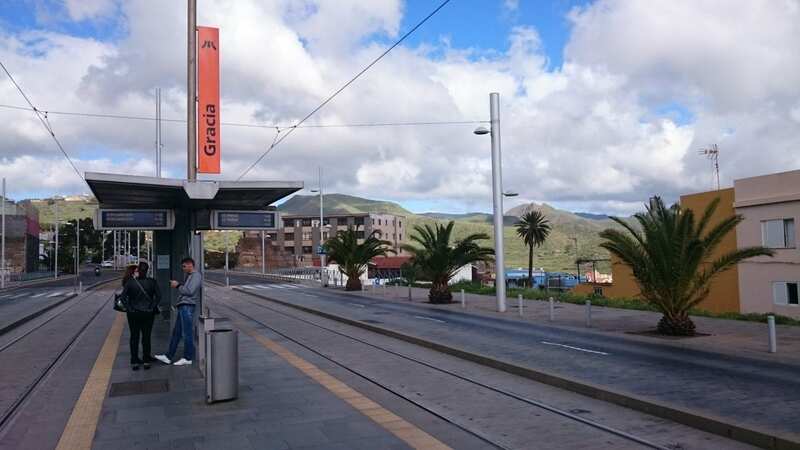 Then you can choose to take the tram up one station to La Gomera which is named La Trinidad or you can take it all the way down the hill to Santa Cruz, where the line ends at Intercambiador. The view you get from the seat when going down is such a stunning experience in our opinion. It really doesn’t matter if you sit on the right or left side, as the view will be visible from both sides during the journey. This is ofcourse the very same case if you take the tram back from the centre to La Trinidad. The views from some of the stations are just breathtaking! Also a nice advice for you! If you do take the tram instead of the bus, you might even bypass all of the traffic jams as the tram lines never shares road with cars. Especially in the rush hours, it is a wise thing to do. Also if it is very hot, it is nice to change from bus to tram, and you also save the enviroment. Fresh air is great, isnt it? The scenery of the mountains, the colourful Canary houses, palm trees and the Atlantic ocean from the tram is worth the trip. If you love to take trams like me, or is one that likes to watch how the locals lives their lifes, then you will get a treat aswell. The colourful Alstom Citadis 302 trams are a treat for the eyes. I never felt bored when taking the pictures of them and they really move like in any other tram city, but the rails stays on its own everywhere. The tram even got a few tram tunnels. Two of them can be found where both of the lines meets and one at the top near La Gomera town. 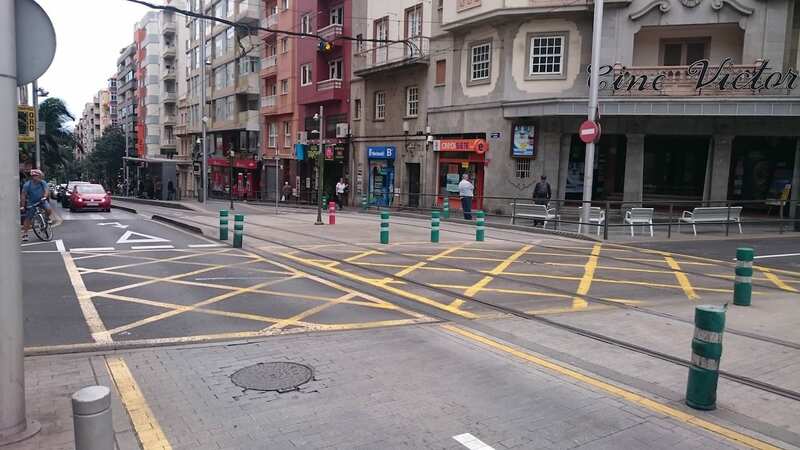 What also makes me love this tram system, is that even where the trams are supposed to share the street with the cars, those parts are closed totally off for cars to drive on! This is really smart thinking and makes this tram a much faster tram system than in many other cities in the world. 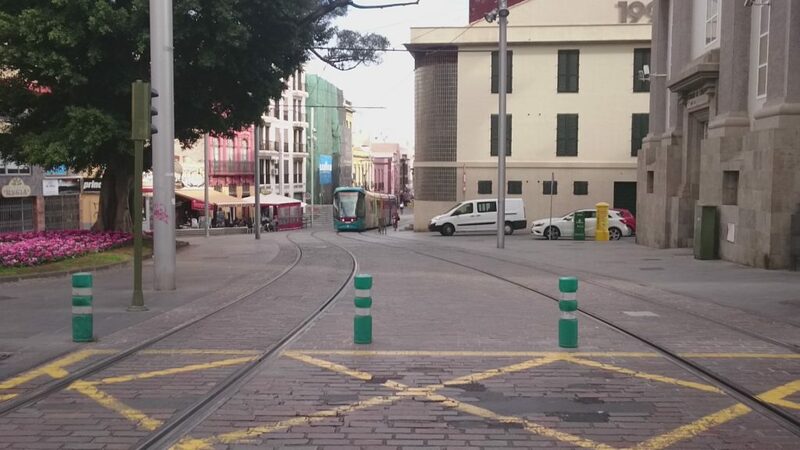 Making the tram system in Tenerife, one of the best tram systems in the world in our view. Yes, it is very tiny, but the comany behind it tells to Distrita, that they have huge expanding plans, and even a train route going from north to south of the island. 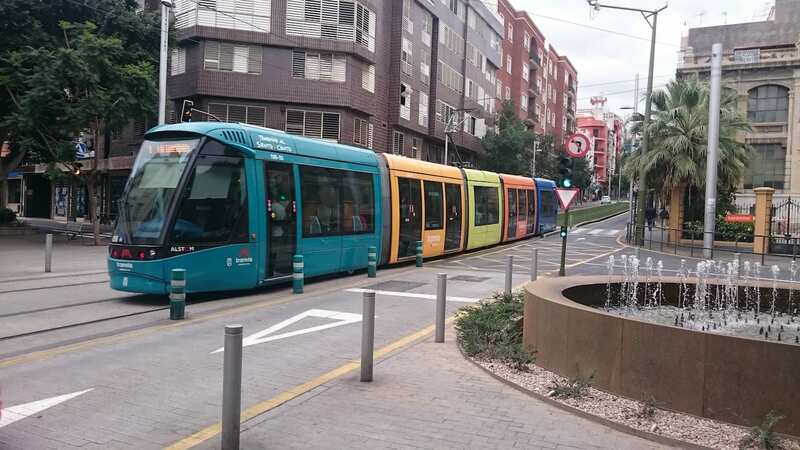 As mentioned, the company called MetroTenerife, which is behind the tram also got plans for a train route. But we at Distrita thinks that it would be rather much more interesting to extend the tram all over the island. This would reduce the costs! Also, it would reduce the traffic jams a lot. If the Canary Island citizens really want to help Teide and the nature on the island. A tram solution would benefit a lot and be a really nice solution. Also trams can climb steep hills, which the island got many of. A train route is a great thinking, but the idea of extending the tram system is a much better idea. 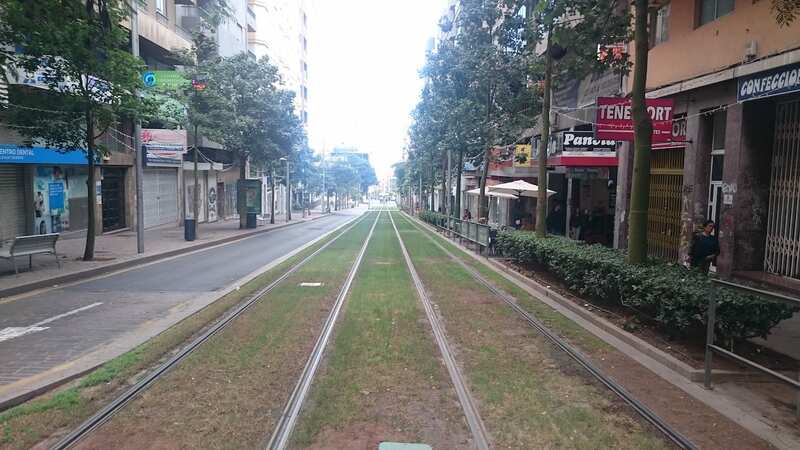 How about a old tram going from the centre of Puerto De La Cruz to Loro Park? That would be a fantastic thing to do. Getting ridd of the smelly touristic trains, and we want to help the animals in the zoo, right? Look to Mallorca. Puerto De Soller got a tram, connecting a very old train line etc. Tenerife is really moving towards right direction and it is an example on how every town and places on earth should think. Busses are great to have, but together with lots of smelly cars, they do pollute a lot. Not just the gas, but also the gummi wheels pulls unhealthy asphalt up in the air. The trams runs on electricity and there is minimal or almost no unhealthy dust is pulled up into the air. 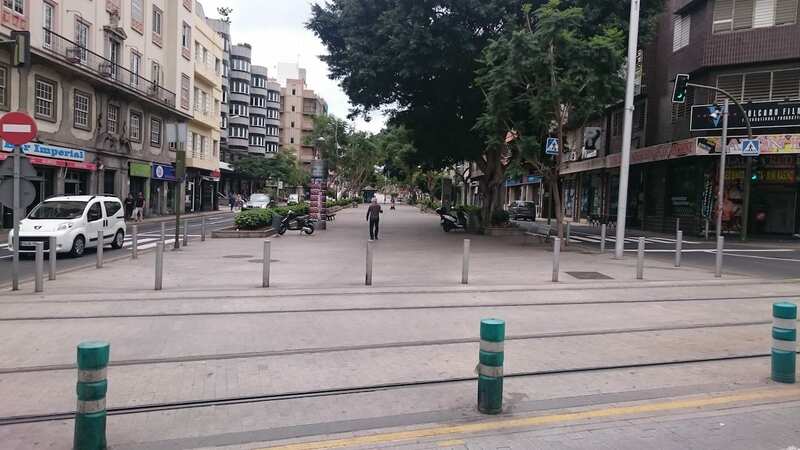 We have been to many tram cities in the world and we think that the tram system in Santa Cruz on Tenerife, should be a model on how tram systems around the world should be built in the world. Porto in Portugal, Bergen in Norway and Bremen in Germany are just some of the towns that Distrita have visited and can compare with as they sort of have same goals for how trams should be built. Not on street with cars etc! But with great solutions like we show in this article. If we think and build smart, the waste of money will also be less. Trams are the best way to get around and they can be looong. 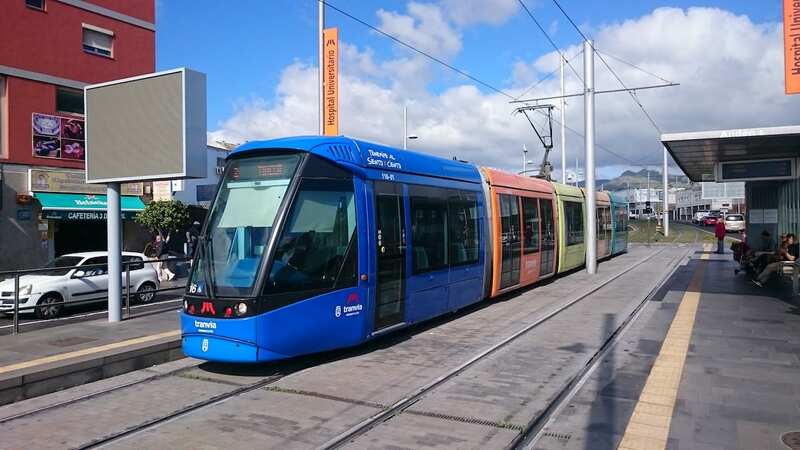 Comment below on what you think of the tram system on Tenerife. Share and like if you like to read such articles more on Distrita. Great network, great trams and stunning views. 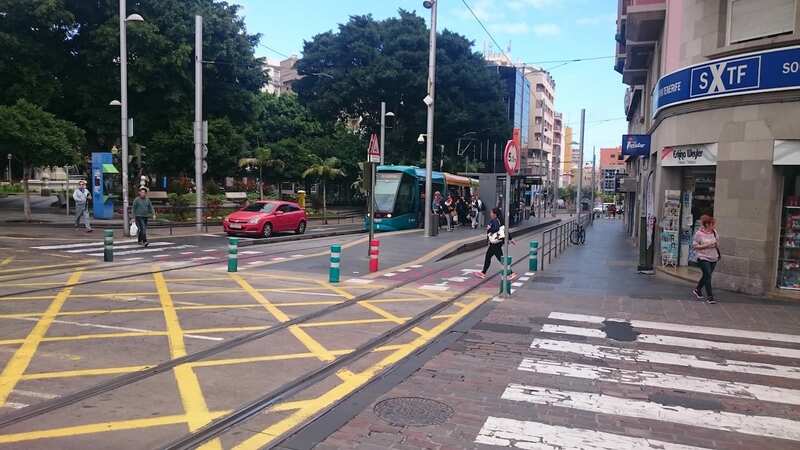 Santa Cruz and La Laguna are beautiful neighbour cities that is now linked by this new tramway on Tenerife. The steep climbing downhill and uphill, makes this tramway excellent. With only minor complaints,.. we would rate this as one of the best tram networks in the world out of the criterias regarding how a tramway network should be. Gracias to MetroTenerife! and Gracias to all citizens in this region. An enviromental choice is brought back to life on Tenerife. Viva Tranvía de Tenerife! Shortest Railway Line named Angels Flight opened again in California, USA!